Diesel particulate filters are roughly equivalent to catalytic converters on cars, except they’re fitted to the exhaust stacks of heavy-duty trucks and construction equipment. Formed in 2007, FSX makes the equipment for cleaning those filters. It’s a green business. Not only do the filters remove soot and ash, but cleaned filters allow a truck to use less fuel. It’s a growth business, too, spurred by regulations mandating installation of filters and increased demand for equipment to clean the filters effectively. 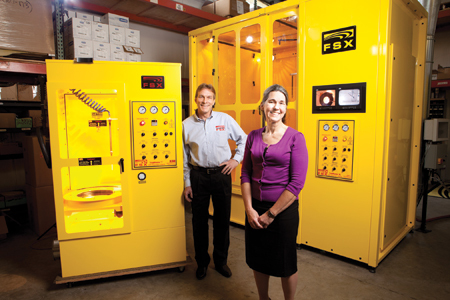 Operated by Diane and Cole Waldo, FSX doubled employment and sales from 2009 to 2010, investing in capital equipment as well as research and development to improve its filter-cleaning machines. The firm landed major truck manufacturers as customers. Paccar Parts announced last year it was offering FSX machines at Kenworth and Peterbilt dealers, noting that the company’s technology got filters 9 percent cleaner than the next-best model. Navistar added FSX machines to its dealer network, too. Transit, school and government agencies are ordering FSX’s equipment for their fleets. Growth prompted FSX to split its filter remanufacturing business into a separate entity, FSX Reconditioning. Truck makers can send in plugged filters and order like-new filters as replacement parts. Bellingham entrepreneur Paul Akers describes his approach to teaching lean principles of productivity improvement this way: “All I do is ask everybody to make a two-second improvement a day for the rest of their life.” An accumulation of two-second improvements and a relentless emphasis on lean methods have helped build FastCap from a single product—a peel-and-stick cover for cabinetry holes—into a $10-million-a-year business with dozens of tools and products, and with a goal of introducing at least one product a month. The company starts every day with an employees’ meeting to discuss problems and solutions, and to reinforce lean concepts as part of the corporate culture. Lean also helped FastCap avoid the ravages of the recession, even though its customer base is concentrated in the construction business. FastCap avoided layoffs, he says, and because it was able to add people, equipment and technology, it will be well positioned when the recovery arrives. 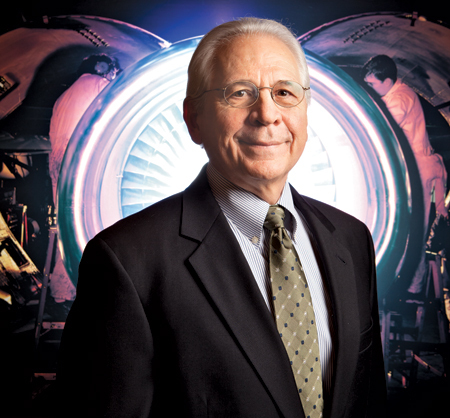 Italian conglomerate Umbra Group wanted to see more growth from its Everett-based aerospace-parts company when it hired General Electric veteran Robert Collett to run the operation in May 2009. “They were looking for someone who was hands-on and they found it,” says Impact Washington consultant Bob Uptagrafft, who worked with Collett and the company, which is based at Paine Field Corporate Park, not far from its biggest customer, the Boeing Co.
Collett didn’t just have managerial experience and perspective. According to Uptagrafft, the new CEO came up through the blue-collar ranks with an abiding appreciation for how a machine shop works and how it should be organized. 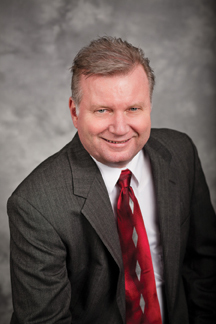 That experience and his own people skills have enabled Collett to navigate the hazards of shaking up the workplace through implementation of lean operating practices without demoralizing the workforce, Uptagrafft says. The results: Costs came down and reliability in getting parts out the door on time went up. Uptagrafft says Umbra, which makes ball screws, drive rods and related parts for the operating surface flaps on aircraft, is well on its way to achieving a goal of doubling sales in three years. The parent company in Italy appears to be pleased. From debating whether to keep the Everett operation going, Umbra has gone to considering having the facility take on fabrication of other products in its lineup. The numbers alone would suggest something’s going right with Esterline, which makes components for the aerospace and defense industries. It followed record performance for fiscal year 2010 with an earnings report for the first fiscal quarter of 2011 in which Esterline had revenue growth of nearly 11 percent over a year ago and more than doubled its income from continuing operations. Guiding the 44-year-old company is Brad Lawrence, who joined Esterline in 2002, having worked at such well-known Washington manufacturers as Paccar and Flow International. He became a group vice president in 2007 and was named president and then chief executive officer in 2009. Esterline has been carefully refining its lineup of companies over the years to focus on key markets. It’s a strategy Lawrence has continued. Last year, it sold a small pressure-instrumentation business, but it bought, for $120 million, a Texas firm with expertise in signals and communications hardware for airborne intelligence, surveillance and reconnaissance. That addition fits in with its existing businesses, and taps a potential growth market in the increased use of unmanned aircraft. With the company’s participation in major defense projects, and with Boeing and Airbus increasing build rates on existing aircraft and launching new models, Lawrence and Esterline would appear poised for more growth ahead. And while most of Esterline’s business comes from aerospace and defense, Lawrence also has his eye on applying Esterline’s core technologies in avionics and controls, sensors and systems and advanced materials to new markets such as medical equipment, high-speed rail networks and nuclear power. Contract electronics manufacturer Silicon Forest had enjoyed a nice run of growth from its founding in 1999, but in 2009, one of its largest customers sliced its order. 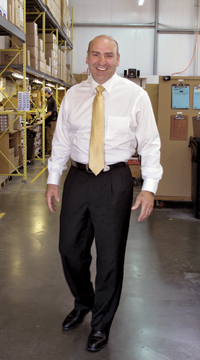 President Frank Nichols shifted from growth to a break-even strategy: Keep the company’s resources in place to be available when demand rebounded, and emphasize customer service and product quality, both essential elements to retaining existing customers and recruiting new ones. The approach paid off. Since June 2010, the order backlog has nearly doubled, hiring has resumed and Silicon Forest has landed new accounts as it seeks to broaden its portfolio in aerospace, defense, instrumentation, homeland security and medical devices.